Success At School. Success at school. Read Successatschool.org news digest here: view the latest Success At School articles and content updates right away or get to their most visited pages. Successatschool.org belongs to a large group of moderately popular websites, with around 104K visitors from all over the world monthly. It seems that Success At School content is notably popular in United Kingdom, as 30.1% of all users (31K visits per month) come from this country. We haven’t detected security issues or inappropriate content on Successatschool.org and thus you can safely use it. 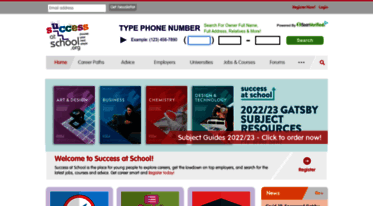 Successatschool.org is hosted with EveryCity Cloud Management (United Kingdom) and its basic language is English. Career advice for schools and students aged 13-19. Search jobs, advice & find out about employers, work experience, courses, career choices, apprenticeships and university. Learn more about the different vocational subjects you can study and the qualifications you can get – including BTECs, NVQs, Technical Awards and Tech-levels. Wondering what you should write on your first CV? Our CV template for secondary school students will help you create a job winning CV.